If your refrigerator is making a buzzing noise or a constant repetitive clicking noise, here are 2 reasons why that can occur. There are 2 different types of fan motors in your refrigerator. One is located in the freezer and this one is called the evaporator fan motor. The other is located behind your fridge and it is called the condenser fan motor. To repair and stop this buzzing or humming noise, first make sure the fan blade is not hitting anything. If the fan, motor and surrounding areas look fine, you will more than likely need to remove and replace the fan blade or fan motor. To repair a buzzing or noisy refrigerator you will need some basic tools and of course the fan motor you are going to swap out. First determine where the noise is coming from. If it is inside the freezer then you need to buy a new refrigerator evaporator fan motor. If the noise is coming from the bottom and back of the fridge you will need a refrigerator condenser fan motor. Here is what a noisy refrigerator evaporator fan motor will sound like. Here is what a noisy refrigerator condenser fan motor will sound like. Here is a video to show how to replace a noisy refrigerator evaporator fan motor. Here is a video to show how to replace a noisy refrigerator condenser fan motor. Do you know of another method to repair a buzzing or noisy refrigerator? Please leave a comment below. My GE Profile started making a noise when I connected it to a generator during Hurricane Irma because I had no power. My fridge has the bottom freezer. Will appreciate anyone telling me how to stop the noise. The fridgeration and freezer work as usual. It’s just the annoying noise when the unit comes on. Could the fan blade be hitting something to make the noise? Any help will be appreciated. I don’t want to have to pay for a service call. Thanks. What is the remedy for my Bosch logixx fridge compressor that vibrates for about 5 seconds whenever the door is shut. It’s still at its peak performance, except for that occasional sound. Pls my freezer model is BRUHM (BCF-SD200). when i put on the freezer, it starts working properly then after a while, it starts making a noise in the compressor compartment and then it stops working. It does not cool anything again. I opened the compressor compartment and realise that the compressor was vibrating and then condenser fan was not moving. Pls what can i do to resolve this problem. My GE side by side make a clump clump clump sound before the fan starts. I just replaced the fan motor last week following the instructions on the video. The old motor did the same thing but would not start blowing allowing everything to thaw and get warm. The fan will start but makes the noise for a couple of minutes before starting. Before you spend money replacing the motor try this. It worked for me. With your refrigerator unplugged remove the cowling over the evaporator fan in the freezer, and with your thumb and index finger placed near the center of the fan blade unit, push back towards the motor until you feel the fan blade pop back into place over the spindle. Over time apparently the fan blade itself had worked its way forward and off of its proper fitting on the spindle. I popped it back on and it’s been working with no noise ever since. You just saved me time, money, and having to deal with an annoying fridge repair around the holidays. Thank you so, so much. My not quite 2yr old whirlpool fridge double door and freezer on bottom (model#WRF989SDAW00) is making a very loud noise. Can’t tell if compressor is going or if it’s the condenser fan motor…..it sounds the same to me……very LOUD. I unplug it does well for a few minutes then starts again……at times if I open fridge door it stops. Our counter depth Samsung side by side fridge is 1 yr. old. It started making noises but stopping when the door was opened. I called the dealer I bought it from and asked if they had any suggestions. They asked if the freezer was very full. It was. They suggested taking some contents out which I did and put them in another freezer. They said if that didn’t work to unplug the fridge for 15 minutes then re-plug. After making more space in the freezer, there was no noise problem. I have a G.E. fridge and my issue seems to be that the condenser fan blades rub on the housing and chirp very loudly.. i’d adjusted the blade multiple times with no luck. Any idea how to make it stop? I at one point trimmed the blades so it would stop but the plastic proved hard to cut nicely and i ended up with an uneven fan that gave the fridge a bit of a shake and hum. I replaced the fan blade with a brand new one but still have the horrible sound… could a faulty motor be at fault for this blade rubbing like this. it seems to have started randomly one day for no reason. Buy a new fan assembly. This will include the fan blade and the motor. Install it and adjust it in a position so that it is not hitting anything therefore stopping the noise. The fan motor could be causing the noise that is why we say replace the whole assembly. They are cheap and can be ordered online with same day shipping if ordered early in the morning. Can you recommend a Website where I can order a Fisher and Paykel refrigerator condenser fan motor assembly? Preferably sold in NZ? Here is a company in NZ that supplies parts for Fisher Paykel Refrigerators… Here is the part you may need (FISHER PAYKEL ACTIVE SMART FRIDGE FAN MOTOR FREEZER), check the model number of your fridge to be sure. Thanks for replying to my comment below about the fisher and paykel website and where to buy the freezer fan. I did go to the link but I couldn’t find the right part. Could you please help me? The model number is E402B the fan has on it FP P/N 880923. Try here at eBay Australia for Fisher and Paykel FREEZER FAN. Thank you so much for your response! I’ll give it a try. The evaporator fan is icing up on my 10 year old GE side by side refrigerator and making a very loud noise. Everything else is working fine and there isn’t ice build up anywhere else. When I melt the ice on the evaporator fan (by using a hair dryer) the loud sound goes away, but in a few weeks it is iced up again and making the loud noise. What could be causing the ice build up? Should I replace the evaporator fan motor? If the evap fan is not turning when it should, it can get ice build up and make loud noises if it runs intermittently. If your fridge/freezer has no other issues, then yes the fan may not be running when it should. Replace it and monitor the outcome. If the problem persists, please let us know and we can provide further help. I have that EXACT same model fridge (so thankfully, this was very informative) however I cannot find anyone who stocks that exact model. I am in Australia so that might be a bit of an issue but would you happen to know the part number for this fan motor? Which refrigerator do you have? Model Number? Which fan do you need a part number for? Cond or Evap? My Whirlpool refrigerator is about 8 years old and has started to make a small squeaky noise, like something is loose or wobbly; seems like its coming from the outside of the fridge, not the inside. What can that be? Its a model GS5SHAXTO01, serial SU4431284. Thank you. Have you checked the back of the fridge to be sure the fan is not the object that is causing the squeaking? Check the fan at back as this is the most likely component causing the exterior squeaking noise. We just got a new Kenmore 6505 three days ago. And when the compressor goes it is LOUD – when it’s off the Fridge is quiet as a mouse. Wondering if there is a way to deaden this noise somehow. The sounds is a loud hum – it literally keeps me up at night. Ideas? Suggestions? Kenmore, of course, says it’s normal. Our old one was at least 15 years old and never made a peep. Something in the back of the fridge may be loose or not tight. When your Kenmore refrigerator is running, go to the back of it and visually check to find where the vibration is coming from. Once found, either tighten loose bolts or screws, or see if 2 components are chaffing therefore causing the noise. I was fairly certain that I had a noisy evaporator fan as the sound would stop when either door was open and it sounds like it is coming from the freezer compartment. I replaced the evaporator fan motor yesterday, but it didn’t seem to make a huge difference in the sound. The sound is intermittent. Any suggestions? It is GE built in side-by-side. The sound only happens when the refrigerator door is closed? Have you checked that the evap and condenser fan blades are not rubbing the housing when running? Check and if rubbing or chaffing then bend back into place or replace both motor and fan motor. My refrigerator sound coming like beep after 15-20 minute interval. What kind of problem may be possible. What make and model number is your refrigerator? Is it beeping or buzzing? Is it coming from inside the fridge or the control panel? Do you receive an error code (if applicable)? My fridge does not sound like the noises above, it makes a very high pitch sound which has gotten higher over the last couple of months and louder. It’s very reminiscent of an extremely loud cricket that doesn’t quit for about 15 minutes at a time. Any answers and suggestions as to how to fix this? Fridge is an LG and just a few years old. Most likely it is a fan either down in the bottom of the back of the fridge or in the freezer. Can you tell us where the sound is coming from? What make and model is your refrigerator? I have never taken a look behind my refrigerator before, I didn’t realize there was a fan present. Perhaps I should investigate mine, and do some preventative maintenance. It will work better if it is in optimal condition. 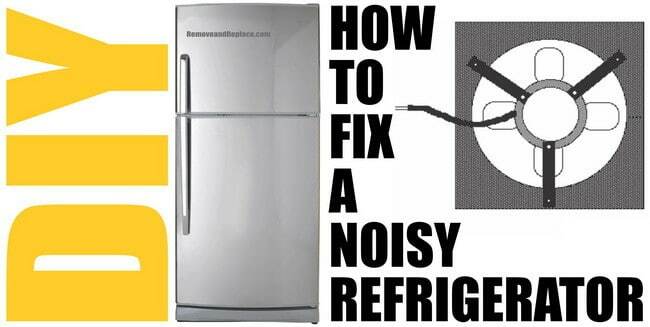 Noisy refrigerators! I should probably start by doing what you suggest, and inspect the fans. Then I can see if there is anything in them, and I can figure out which of the fans is making the noise. I think it is probably the condenser motor, since it seems to be coming from the outside. A buzzing refrigerator is not only annoying, but suggests that there is a problem with your fridge. You make a good point to distinguish between the two fans on a refrigerator: the evaporator fan motor and the condenser fan motor. It is important to distinguish which one is troublesome before attempting any repair. I ignored the buzzing noise coming from my refrigerator thinking it was nothing, until after it kept going for two weeks straight. Now I’m starting to think that there’s something seriously wrong with my fridge, and I really want the buzzing noise to go away. According to the information that you posted, the problem with my fridge needs to be fixed by replacing the condenser fan motor, since the noise is coming from the bottom and back of my refrigerator. Now I can get the right part at a home improvement store so that I can finally fix the problem. Thanks for the tips! Hi! Thank you very much for this information on how to repair a refrigerator that is making noise or has other issues. Refrigerators are a big part of every day life, as many people have at least one and sometimes more in their house. I think it’s good to be educated and to know how to maintain and repair them if they are every not working properly. Thanks for the information. My refrigerator has been SO noisy lately! It’s loud enough that my kids can’t even sleep. I’m going to follow your tip about hiring a repairman. Should I have him look at the “evaporator fan motor”, just like you suggested? Or do you think it’s something else? A refrigerator can make noises for many different reasons. One of the most common and easiest to FIX YOURSELF is the evaporator fan and or motor. If you know where it is located and how it works, fix it yourself to save money. If you are intimidated by repairing appliances, then it may be best to call a repair service. Thank you for the instructions on how to fix my noisy refrigerator. I really appreciate it because the noise caused by my fridge was starting to drive me crazy. The video made it even better because I could actually see what the article was talking about. Hopefully I will now be able to fix my fridge without breaking it. Thanks for the tips! I’ve been trying to figure out what’s been causing my refrigerator to make a buzzing and clicking noise. It’s good to know that it’s because of problems with either the evaporator fan motor or the condenser fan motor. I really appreciate that you’ve pointed out where to check for the noises that are coming from my fridge. The noise seems to be coming from inside of the freezer, so I suppose I should buy a new refrigerator evaporator fan motor. Thanks for the information! Hi, I have a Samsung refrigerator model #RS267LABP. The inside freezer fan motor was not working I replace new and did not work, then I replace the main control board and did not work. I left run the refrigerator and check tomorrow . If you have a multimeter, check to see you are getting proper voltage to the fan. Why did you replace the main control board if the fan did not work?